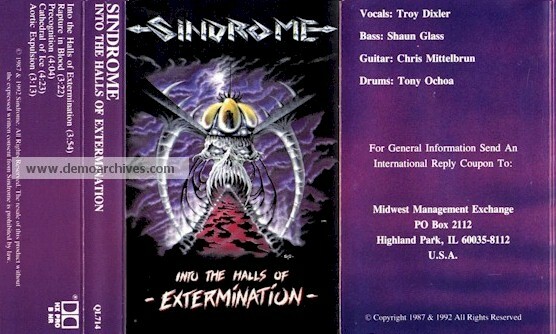 SINDROME was forged in 1987 by an alliance of members from name Chicago thrash acts. Guitarist Chris Mittelbrun is erstwhile DEATHSTRIKE and MASTER, both vocalist Troy 'Dickslurp' Dixker and guitarist Erv Brautigam are formerely with DEVESTATION whilst bassist Shaun Glass was with TERMINAL DEATH. Their opening product would be the demo 'Into The Hall's Of Extermination' with second session 'The Vault Of Inner Conscience' following in 1991. The band added former LÄÄZ ROCKIT guitarist Ken Savitch in 1991. HAMMERON and BEYOND guitarist Mick Vega was inducted in 1992. Upon the band's demise bassist Shaun Glass travelled on to BROKEN HOPE the Nu-Metal band SOIL and TERMINAL DEATH. Pro made Covers and pro printed cassettes. Band pictures and lyrics. Pro made Covers and pro printed cassettes. This is the Re-released version of the 1987 demo. It has a different cover. Completely different layout.